Brainstormings are wonderful things, and we creative types really love them! 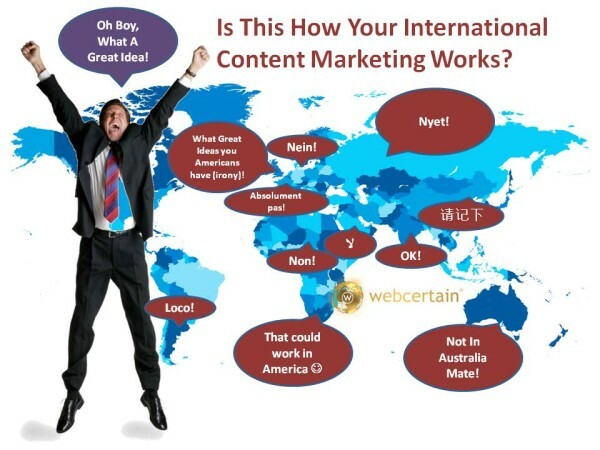 But, the writing is on the wall for brainstormings in international content marketing! We know that content is the new marketing driver which many are talking about. Google has driven us to it with a variety of animals (Pandas and Penguins) and has threatened to unleash even more terrible creatures on our poor quality content this year if we don’t behave. Move over Pandas and Penguins, the Tigers are about to be unleashed. So, if you’re a global company, it’s fair to say that your international content strategies are the difference between winning or seeing your competitors sail away with the main prize. It’s clear that many have realised the importance of making your own brand-domain a magnetic go-to Web destination in today’s online marketing world. What isn’t clear is how many have fallen into the brainstorming+translation trap which is one of the most dangerous places to be. Why is this? The issue is that the very brainstorming which comes up with all those super duper ideas that are going to stun the audience with their brilliance and bring them in droves to the website, is the very fuse that will light a much large explosion in dissatisfaction with the brand and its marketing team in the rest of the world. Let’s take an extreme example. Let’s imagine that you sell healthcare services to Americans. To promote your capabilities to doctors, you create a fantastic infographic which tells the story of how many are using insurance, how many are on medicare and what the health differences are between them. Indeed, that may be something which works well for those doctors in the US — fantastic; roll out the translations. But wait — will this work in Germany? Nein danke! Will this work in France? Absolument Pas! What about Italy? No grazie! Surely the UK? Guys, we have the NHS, which is a bit different to your system! In fact, the majority of nations have their own healthcare system with its own quirks and foibles — the infographic simply isn’t worth translating. We should localize it then, right? Well, you see, this isn’t so great, either, because what it means is starting with the same idea and then trying to make it relevant, and it’s just not going to be. Ever. One solution would be to “Go Local,” right? Yes, I know that’s what everybody says, and it’s so much simpler — except, it isn’t. Going local means giving up control and not taking the brand forward consistently, and there are significant risks in that approach. There must be a better way. The problem starts with the idea generation process. If a team in the US — or any single country, in fact — comes up with a bunch of clever ideas, you can bet that they’ll be based on their own experience of their own homeland. So, the solution, in fact, is to re-plan the idea generation process. There are a number of ways of doing this. Our preferred approach is to bring together a team of people from all over the world to a single location to discuss and generate ideas which will work in multiple regions — but not necessarily everywhere. It’s relatively easy as we have a team from all over the world, and any organization could achieve this by flying in representations of the organization or its partners to generate and evaluate the ideas. This seems expensive at the time, but it will save you so much money in the long run that you simply have to treat this as a wise investment in the future global success of the business. For cultural reasons, and because the make up of countries or regions varies greatly around the world, it is rare that a single idea will really work everywhere — so best not to shoot for that. However, there is a significant benefit in grouping regions around each idea you come up with and choosing the most regionally compliant ideas for the campaign roll-out. The savings in terms of content cost, updating and maintenance, as well as the success of the ideas deployed, is huge. On top of the huge and here’s an idea to save you thousands and generate millions statement, so few are capable of doing this that you can expect to leave your competitors in a thick trail of dust!